Our simple yet informative guide to the Holdsworth Villa and Vision VW camper conversions should help when understanding the model differences. Established in 1968, Richard Holdsworth as the company is sometimes referred to was one of the first camper conversion companies in the UK. Their quality of build and attention to detail gained them many followers and awards, but sadly like Autohomes they also ceased trading in the mid 90s. We buy Holdsworth Villa and Vision campervans, so if you have one to sell please get in touch by calling 0121 453 4577 or by using our online valuation form. 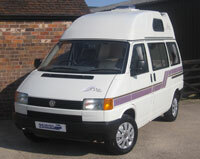 View our current stock of Holdsworth Campers for sale.